An ‘A’ in an honors course beats an ‘A’ in a non-honors course. Duh. Students and parents often ask us if it is better, from the standpoint of highly selective colleges, to get an ‘A’ in a non-honors course or a ‘B’ in an honors course. We understand that honors courses can be challenging. And we understand that it is more difficult to get an ‘A’ in an honors course than an ‘A’ in a non-honors course. Duh. And while students and parents may not like our answer (in fact, they may strongly dislike our answer), the answer is that students should get ‘A’s” in honors courses. Insert your eye roll here. But that doesn’t mean it isn’t true. The truth can sometimes hurt! Highly selective colleges want to see that students take the most rigorous curriculum possible at their high schools. They want to see that they’ve challenged themselves as much as possible. So if an honors course is available at the student’s high school, the student should by all means be taking it. That is if the student hopes to gain admission to a highly selective college. 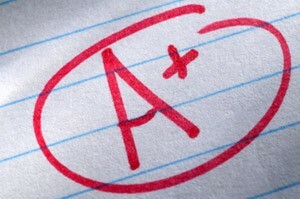 Getting great grades in non-honors courses speaks to the fact that the student doesn’t wish to challenge him or herself. The student comes across as though he or she wishes to breeze through high school. The student comes across as not intellectually curious, a major, major faux pas in highly selective college admissions. So take the most rigorous curriculum possible at your high school. And excel in that curriculum. It may not be the easiest thing to do but neither is getting into a highly selective college so it’s high time to start rising to the challenge! You don’t want to get ‘B’s’. And you should take the most rigorous courses offered. And then some. So that leaves you to getting ‘A’s’ in the most rigorous curriculum possible, by our bulletproof logic. Sorry if it frustrates you. But it’s the case so the sooner you accept this, the better.